Drummer Sean Dobbins showcases Austin Aldrich, a junior at Huron High School Austin plays the bass in jazz programs at Community High School, the Huron River Rat Jazz Orchestra and Spartan Youth Jazz Orchestra of Community Music School-Detroit. Austin started his musical journey on the electric bass guitar at the Ann Arbor Music Center and at 9 years old he made his onstage debut at the Ypsilanti, Mich., Tap Room with the classic rock cover band, The Infernal Chimps. When the time came to select a school instrument in fifth grade, he picked the double bass and has played in a variety of school-based and community based orchestras and bands as well as combos and ensembles. 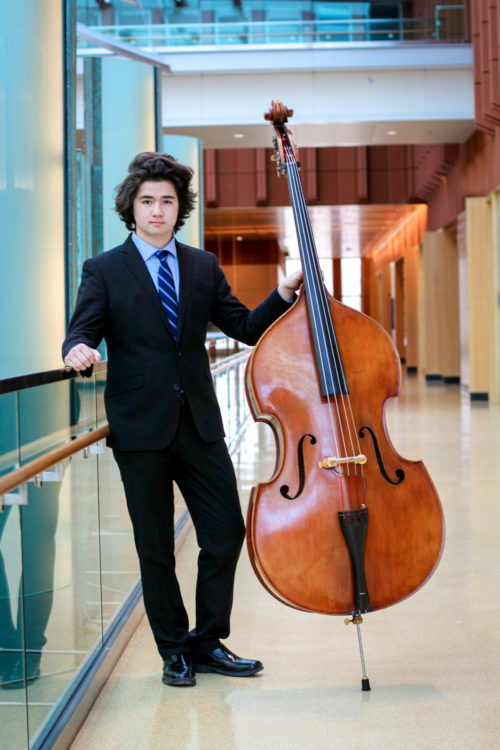 Equally adept on electric bass, Austin also plays in pit orchestras for musical theater productions in Ann Arbor. Although his love of music includes various genres, Austin is the most passionate about jazz. Some of Austin’s achievements include performing with the Huron Symphony Orchestra at the 2016 Midwestern Clinic in Chicago, the 2018 MSBOA All-State High School Orchestra, the 2018 Idyllwild Arts Symphony Orchestra in California, the 2019 MSBOA All-State High School Jazz Band, winning the 2018 CMU Jazz Competition Division AA for Jazz Band with the Huron River Rat Jazz Orchestra, being recognized as a member of the 2018 Michigan Youth Jazz Combo of the Year and numerous Level I proficiency awards in the MSBOA state solo and ensemble competitions.